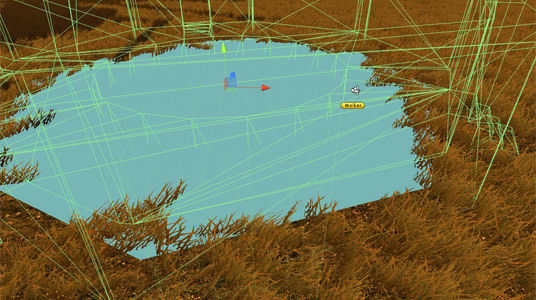 Radiator Blog: How to dig holes in Unity3D terrains. UPDATE FOR 2019: This post is 7+ years old, and new versions of Unity have updated the Terrain system. In principle, this technique should still work -- but the specific code and variable names are probably broken. I have no plans to update this post. Good luck. 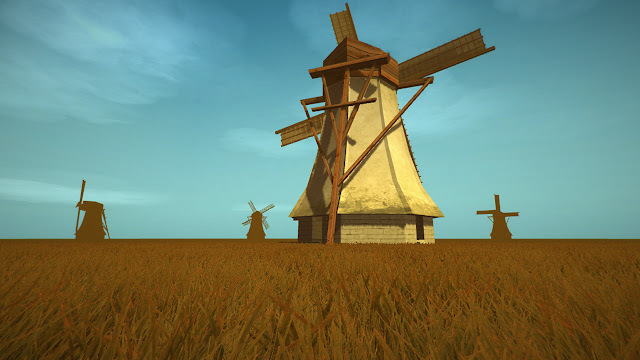 Say you're making a Unity game that takes place in a large landscape dotted with windmills, and some of these windmills have tunnels that lead underground. But in Unity, the terrain collider is generated from heightmap data: it's essentially one giant bumpy plane. You can't punch holes in it. 1) Hiding a piece of terrain geometry with a "depth mask" shader. 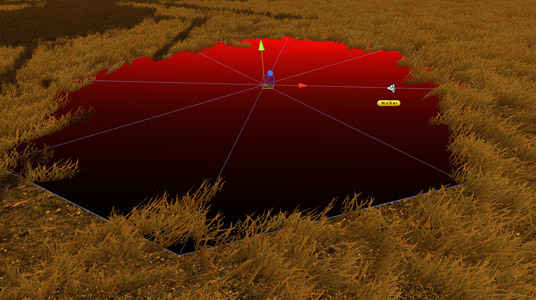 2) Disabling the collider so the player (or whatever) can pass through the hole, but collides with terrain other times. To decide what to draw and when, 3D engines draw meshes in a certain order (Unity calls this the "render queue") so it can figure out what blocks what from the camera view. This is what happens when, say, a particle system sprays steam particles into a wall, and the wall cuts off part of the sprite; in that case, the wall came earlier in the render queue, so it blocks the part of the sprite that is stuck inside the wall. Why draw something that's behind a wall? 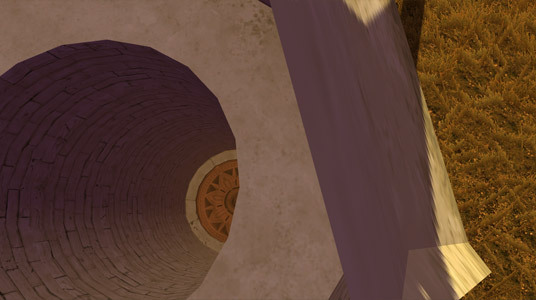 So if we can trick the engine into thinking there's a wall, it won't draw anything behind it, even if we don't render the wall, meaning we can selectively cut out pieces of models. That's what we do with a "depth mask" -- it's an invisible wall that hides whatever is behind it. I've also overridden my default Unity terrain shader, just to make it render later in the queue, at "Geometry+100" which is AFTER the depth mask ("Geometry+10"), and I do this because I want to cover the edges of the hole with a tunnel model ("Geometry"). So my render queue now looks like this: brick tunnel >> depth mask >> terrain. Now we need a hole model. You're trying to model out the "mass of empty space" that the hole would otherwise occupy. public Collider player; // assign in inspector? public TerrainCollider tCollider; // assign in inspector? ... and then I put it all together and cover the edges of the hole with my tunnel model and boom: grassy landscape on the right, deep brick abyss on the left. Done! I imagine you can use this technique for making caves, craters, whatever. There are also some strong augmented reality uses for this. Now get digging!